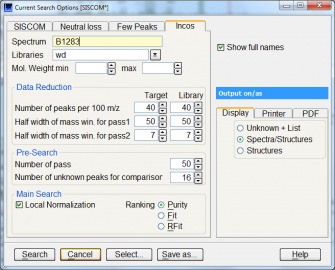 The INCOS search module extends the base module (containing SISCOM, Neutral Loss and Few Peak searches) by the INCOS spectra search algorithm (INCOS is the preferred algorithm for match/no match decisions in mass spectra identification work). In MassLib you can select which search algorithm you want to use for a particular problem. You can save multiple customized search configurations (algorithm and options) and recall them easily for a particular search.